Are you attending a spring baby shower and you’re at a loss for a sweet affordable gift? Check out Apple Park’s baby gift crates, all-in-one baby gifts that are sure to be a hit with parents and babies alike. Each Apple Park gift crate contains a cute board book made with FSC certified paper and printed with soy ink, a Picnic Pal Blankie made with non-toxic plastic safety eyes, 100% organic cotton, natural silk and natural corn fiber, and a fun Apple Seed Rattle made with 100% organic cotton and natural corn fiber with a natural silk leaf and a recycled non-toxic plastic rattle. The three gifts are packaged in a crate made of 100% recycled paper printed with soy ink and finished with a cotton cord handle. There are six adorable crate styles to choose from including monkey, bear, duck, lamb, bunny and owl. Are you attending a spring baby shower and you're at a loss for a sweet affordable gift? 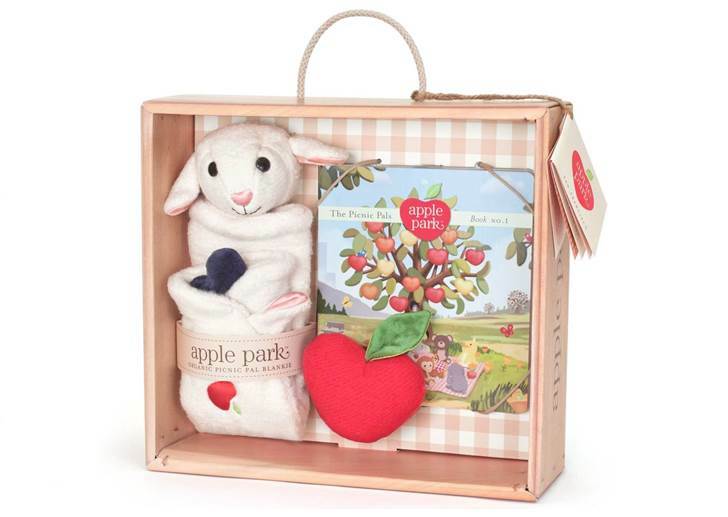 Check out Apple Park's baby gift crates, all-in-one baby gifts that are sure to be a hit with parents and babies alike. Each Apple Park gift crate contains a cute board book made with FSC certified paper and printed with soy ink, a Picnic Pal Blankie made with non-toxic plastic safety eyes, 100% organic cotton, natural silk and natural corn fiber, and a fun Apple Seed Rattle made with 100% organic cotton and natural corn fiber with a natural silk leaf and a recycled non-toxic plastic rattle. The three gifts are packaged in a crate made of 100% recycled paper printed with soy ink and finished with a cotton cord handle. There are six adorable crate styles to choose from including monkey, bear, duck, lamb, bunny and owl.